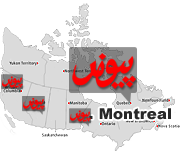 Paivand MEDIA GROUP Paivand established in 1993 is a socio-cultural weekly Newspaper for Iranian and Persian-speaking communities in Canada and worldwide. It publishes every Friday in western Canada in Vancouver, Victoria and Calgary. A separate and independent edition is published on the first and fifteenth of each month in eastern Canada and distributed in Montreal, Toronto and Ottawa. Paivand produces three television programs on two different Canadian networks: Beyad-e-Iran and Iranian Pop on Shaw Multicultural Channel and Paivand TV on Omni. Paivand also produces a weekly live phone-in talk show on RJ 1200 AM. Accounting: Lili Yaghmaie Website Admin: Amir R.